Artichokes, White Balsamic Dill Vinaigrette, Thyme for Cooking easy spring. The artichokes take 40 - 50 minutes to steam, depending on size. 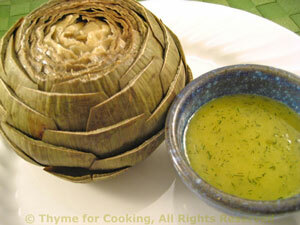 This can be done anytime and the artichokes can be served warm or cold. Have a small, sharp knife handy so that when you get all of the leaves off and are at the fuzzy choke you can cut it off and enjoy the bottom.... and put an extra bowl on the table for the 'used' leaves. Slowly drizzle in oil; whisking until it emulsifies (thickens and combines). Add dill and stir well to combine.